"A reconfigurable plasmofluidic lens", Nature Communications, 4, 2305 (2013). "Plasmonic Demultiplexer and Guiding", ACS Nano, 4, 6433 (2010). "Theory and experiment on particle trapping and manipulation via optothermally generated bubbles", Lab on a Chip, 14, 384 (2014). In this article, a mechanism for quick release and transfer of gold nanoparticles (GNPs) from a soft substrate to another substrate under laser illumination is investigated. The heating of GNPs on a soft substrate with a continuous-wave laser causes a rapid thermal expansion of the substrate, which can be used to selectively release and place GNPs onto another surface. In-plane and out-of-plane nanostructures are successfully fabricated using this method. This rapid release-and-place process can be used for additive nonmanufacturing of metallic nanostructures under ambient conditions, which paves a way for affordable nanomanufacturing and enables a wide variety of applications in nanophotonics, ultrasensitive sensing, and nonlinear plasmonics. A rapid and cost-effective method for the fabrication of nanogap-rich structures is demonstrated in this Letter. The method utilizes the Marangoni convection around an optothermal surface bubble inside a liquid droplet with a nanoliter volume. The liquid droplet containing metallic nanoparticles reduces the sample consumption and confines the liquid flow. The optothermal surface bubble creates a strong convective flow that allows for the rapid deposition of the metallic nanoparticles to form nanogap-rich structures on any substrate under ambient conditions. This method will enable a broad range of applications such as biosensing, environmental analysis, and nonlinear optics..
Single-molecule detection has become a unique and indispensable tool for the study of molecular motions and interactions at the single-molecule level. Unlike ensemble measurement where the information is averaged, single-molecule analysis yields invaluable information on both the individual molecular properties and their microenvironment. Among the various technologies for the detection of single molecules, the detection with optical methods has many advantages in terms of its high sensitivity, electrical passiveness, and robustness. The recent advances in the engineering of either the excitation light or the solution of the molecules have paved the way for enhanced single-molecule detection. We present recent developments and future perspectives for single-molecule detection in the following three regimes: on a dry surface, in solutions at ultralow concentrations, and in solutions at native physiological concentrations. "Optothermally generated surface bubble and its applications"
Under laser illumination, a solid-state surface or nanostructure can turn into micro/nano heating source with the so-called optothermal effect. This effect allows for non-invasive control of the heat at the micro/nanoscales. In the presence of liquid, a surface bubble can be generated on top of the solid surface or nanostructure at a temperature much higher than the boiling point of the liquid. The high temperature and the fluid flow associated with the optothermally generated surface bubble enable many intriguing applications ranging from the micro/nano-manipulation of fluids, particles, cells, and light to the synthesis of micro/nano-structures under ambient conditions. In this review article, we present the fundamentals, recent developments, and future perspectives in this emerging field. "Practical guide to the realization of a convertible optical trapping system"
​In this article, we provide a detailed guide to the construction of a convertible optical trapping system for either single-beam or counter-propagating trap. The single-beam trap maintains all the functionalities that a conventional optical tweezer has. While the counter-propagating trap allows for the trapping of particles that single-beam trap cannot handle. The counter-propagating trap can be easily switched to a single-beam trap, and vice versa. Therefore, this convertible optical trapping system allows for the trapping and manipulation of particles with a wide variety of sizes and materials. "Single-molecule detection at high concentrations with optical aperture nanoantennas"
Single-molecule detection has become an indispensable technology in life science, and medical research. In order to get meaningful information on many biological processes, single-molecule analysis is required in micro-molar concentrations. At such high concentrations, it is very challenging to isolate a single molecule with conventional diffraction-limited optics. Recently, optical aperture nanoantennas (OANs) have emerged as a powerful tool to enhance the single-molecule detection under a physiological environment. 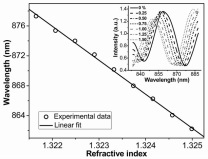 The OANs, which consist of nano-scale apertures on a metallic film, have the following unique properties: (1) nanoscale light confinement; (2) enhanced fluorescence emission; (3) tunable radiation pattern; (4) reduced background noise; and (5) massive parallel detection. This review presents the fundamentals, recent developments and future perspectives in this emerging field. "Probing Cell Deformability via Acoustically Actuated Bubbles"
An acoustically actuated, bubble-based technique is developed to investigate the deformability of cells suspended in microfluidic devices. A microsized bubble is generated by an optothermal effect near the targeted cells, which are suspended in a microfluidic chamber. Subsequently, acoustic actuation is employed to create localized acoustic streaming. In turn, the streaming flow results in hydrodynamic forces that deform the cells in situ. The deformability of the cells is indicative of their mechanical properties. The method in this study measures mechanical biomarkers from multiple cells in a single experiment, and it can be conveniently integrated with other bioanalysis and drug-screening platforms. Using this technique, the mean deformability of tens of HeLa, HEK, and HUVEC cells is measured to distinguish their mechanical properties. HeLa cells are deformed upon treatment with Cytochalasin. The technique also reveals the deformability of each subpopulation in a mixed, heterogeneous cell sample by the use of both fluorescent markers and mechanical biomarkers. The technique in this study, apart from being relevant to cell biology, will also enable biophysical cellular diagnosis. Plasmofluidics is the synergistic integration of plasmonics and micro/nanofluidics in devices and applications in order to enhance performance. There has been significant progress in the emerging field of plasmofluidics in recent years. By utilizing the capability of plasmonics to manipulate light at the nanoscale, combined with the unique optical properties of fluids and precise manipulation via micro/nanofluidics, plasmofluidic technologies enable innovations in lab-on-a-chip systems, reconfigurable photonic devices, optical sensing, imaging, and spectroscopy. In this review article, the most recent advances in plasmofluidics are examined and categorized into plasmon-enhanced functionalities in microfluidics and microfluidics-enhanced plasmonic devices. The former focuses on plasmonic manipulations of fluids, bubbles, particles, biological cells, and molecules at the micro/nanoscale. The latter includes technological advances that apply microfluidic principles to enable reconfigurable plasmonic devices and performance-enhanced plasmonic sensors. The article is concluded with perspectives on the upcoming challenges, opportunities, and possible future directions of the emerging field of plasmofluidics. Given that plasmonic fields are intrinsically transverse magnetic (TM), coupling surface plasmon polaritons (SPPs) and transverse electric (TE) polarized light, especially at nanoscale, remain challenging. We propose the use of L-shaped nano-apertures to overcome this fundamental limitation and enable coupling between SPPs and TE polarized light. Polarization conversion originates from the interference of two resonant modes excited in the nano-apertures and the nearly 180° phase retardation between them. The experiments show that both TE-to-plasmon and plasmon-to-TE couplings can be implemented at the subwavelength scale. This discovery provides great freedom when manipulating light based on SPPs at the nanoscale and helps in using the energy of TE polarized light. Plasmonics, which allows for manipulation of light field beyond the fundamental diffraction limit, has recently attracted tremendous research efforts. The propagating surface plasmon polaritons (SPPs) confined on a metal-dielectric interface provide an ideal two-dimensional (2D) platform to develop subwavelength optical circuits for on-chip information processing and communication. The surface plasmon resonance of rationally designed metallic nanostructures, on the other hand, enables pronounced phase and polarization modulation for light beams travelling in three-dimensional (3D) free space. Flexible 2D and free-space propagating light manipulation can be achieved by encoding plasmonic nanostructures on a 2D surface, promising the design, fabrication and integration of the next-generation optical architectures with substantially reduced footprint. It is envisioned that the encoded plasmonic nanostructures can significantly expand available toolboxes for novel light manipulation. In this review, we presents the fundamentals, recent developments and future perspectives in this emerging field, aiming to open up new avenues to developing revolutionary photonic devices. “In-Situ Fabrication of 3D Ag@ZnO Nanostructures for Microfluidic/Surface-Enhanced Raman Scattering (SERS) Systems”. In this work, we develop an in situ method to grow highly controllable, sensitive, three-dimensional (3D) surface-enhanced Raman scattering (SERS) substrates via an optothermal effect within microfluidic devices. Implementing this approach, we fabricate SERS substrates composed of Ag@ZnO structures at prescribed locations inside microfluidic channels, sites within which current fabrication of SERS structures has been arduous. Conveniently, properties of the 3D Ag@ZnO nanostructures such as length, packing density, and coverage can also be adjusted by tuning laser irradiation parameters. After exploring the fabrication of the 3D nanostructures, we demonstrate a SERS enhancement factor of up to ∼2 × 106 and investigate the optical properties of the 3D Ag@ZnO structures through finite-difference time-domain simulations. To illustrate the potential value of our technique, low concentrations of biomolecules in the liquid state are detected. Moreover, an integrated cell-trapping function of the 3D Ag@ZnO structures records the surface chemical fingerprint of a living cell. Overall, our optothermal-effect-based fabrication technique offers an effective combination of microfluidics with SERS, resolving problems associated with the fabrication of SERS substrates in microfluidic channels. With its advantages in functionality, simplicity, and sensitivity, the microfluidic-SERS platform presented should be valuable in many biological, biochemical, and biomedical applications. We designed a heterogeneous optical slot antenna (OSA) that is capable of detecting single molecule in solutions at high concentrations, where most biological processes occur. The heterogeneous OSA consists of a rectangular nanoslot fabricated on heterogeneous metallic films formed by sequential deposition of gold and aluminum on a glass substrate. The rectangular nanoslot gives rise to large field and fluorescence enhancement for single molecules. The near-field intensity inside a heterogeneous OSA is 170 times larger than that inside an aluminum zero-mode waveguide (ZMW), and the fluorescence emission rate of a molecule inside the heterogeneous OSA is about 70 times higher than that of the molecule in free space. Our proposed heterogeneous optical antenna enables excellent balance between performance and cost. The design takes into account the practical experimental conditions so that the parameters chosen in the simulation are well within the reach of current nano-fabrication technologies. Our results can be used as a direct guidance for designing high-performance, low-cost plasmonic nanodevices for the study of bio-molecule and enzyme dynamics at the single-molecule level. "Dark-Field Illumination on Zero-Mode Waveguide/Microfluidic Hybrid Chip Reveals T4 Protein Interactions"
The ability of zero-mode waveguides (ZMW) to guide light energy into subwavelength-diameter cylindrical nanoapertures has been exploited for single-molecule fluorescence studies of biomolecules at micromolar concentrations, the typical dissociation constants for biomolecular interactions. Although epi-fluorescence microscopy is now adopted for ZMW-based imaging as an alternative to the commercialized ZMW imaging platform, its suitability and performance awaits rigorous examination. Here, we present conical lens-based dark-field fluorescence microscopy, in combination with a ZMW/microfluidic chip, for single-molecule fluorescence imaging. We demonstrate that compared to epi-illumination, the dark-field configuration displayed diminished background and noise, and enhanced signal-to-noise ratios. This signal-to-noise ratio for imaging using the dark-field setup remains essentially unperturbed by the presence of 1 µM background fluorescent molecules. Our design allowed single-molecule FRET studies on revealing weak DNA-protein and protein-protein interactions found with T4 replisomal proteins. "Theory and experiment on particle trapping and manipulation via optothermally generated bubbles"
We present a theoretical analysis and experimental demonstration of particle trapping and manipulation around optothermally generated bubbles. We show that a particle located within 500 μm of a surface bubble can be attracted towards a bubble by drag force resulting from a convective flow. Once the particle comes in contact with the bubble's surface, a balance between surface tension forces and pressure forces traps the particle on the bubble surface, allowing the particle to move with the bubble without detaching. The proposed mechanism is confirmed by computational fluid dynamics simulations, force calculations, and experiments. Based on this mechanism, we experimentally demonstrated a novel approach for manipulating microparticles via optothermally generated bubbles. Using this approach, randomly distributed microparticles were effectively collected and carried to predefined locations. Single particles were also manipulated along prescribed trajectories. This bubble-based particle trapping and manipulation technique can be useful in applications such as micro assembly, particle concentration, and high-precision particle separation. Plasmonics provides an unparalleled method for manipulating light beyond the diffraction limit, making it a promising technology for the development of ultra-small, ultra-fast and power-efficient optical devices. To date, the majority of plasmonic devices are in the solid state and have limited tunability or configurability. Moreover, individual solid-state plasmonic devices lack the ability to deliver multiple functionalities. Here we utilize laser-induced surface bubbles on a metal film to demonstrate, for the first time, a plasmonic lens in a microfluidic environment. Our ‘plasmofluidic lens’ is dynamically tunable and reconfigurable. We record divergence, collimation and focusing of surface plasmon polaritons using this device. The plasmofluidic lens requires no sophisticated nanofabrication and utilizes only a single low-cost diode laser. Our results show that the integration of plasmonics and microfluidics allows for new opportunities in developing complex plasmonic elements with multiple functionalities, high-sensitivity and high-throughput biomedical detection systems, as well as on-chip, all-optical information processing techniques. "Optoacoustic tweezers: a programmable, localized cell concentrator based on opto-thermally generated, acoustically activated, surface bubbles"
We present a programmable, biocompatible technique for dynamically concentrating and patterning particles and cells in a microfluidic device. Since our technique utilizes opto-thermally generated, acoustically activated, surface bubbles, we name it “optoacoustic tweezers”. The optoacoustic tweezers are capable of concentrating particles/cells at any prescribed locations in a microfluidic chamber without the use of permanent structures, rendering it particularly useful for the formation of flexible, complex cell patterns. Additionally, this technique has demonstrated excellent biocompatibility and can be conveniently integrated with other microfluidic units. In our experiments, micro-bubbles were generated by focusing a 405 nm diode laser onto a gold-coated glass chamber. By properly tuning the laser, we demonstrate precise control over the position and size of the generated bubbles. Acoustic waves were then applied to activate the surface bubbles, causing them to oscillate at an optimized frequency. The resulting acoustic radiation force allowed us to locally trap particles/cells, including 15 μm polystyrene beads and HeLa cells, around each bubble. Cell-adhesion tests were also conducted after cell concentrating to confirm the biocompatibility of this technique. "Flexible wavefront manipulation of surface plasmon polaritons without mechanical motion components"
We propose a form of flexible wavefront manipulation of surface plasmonpolaritons (SPPs) without any mechanical motion component. An incoming light pattern, the amplitude of which is modulated by a liquid crystalspatial light modulator, is used to illuminate a grating on an Aufilm acting as a light-SPP coupler. The SPPs launched from the grating have the same intensity distribution as the input light pattern. By changing the input image, continuously variable in-plane SPP focusing on the Aufilm is implemented. The experimental results agree well with numerical simulations. Two-dimensional plasmonic demultiplexers for surface plasmon polaritons (SPPs), which consist of concentric grooves on a gold film, are proposed and experimentally demonstrated to realize light−SPP coupling, effective dispersion, and multiple-channel SPP guiding. A resolution as high as 10 nm is obtained. The leakage radiation microscopy imaging shows that the SPPs of different wavelengths are focused and routed into different SPP strip waveguides. The plasmonic demultiplexer can thus serve as a wavelength division multiplexing element for an integrated plasmonic circuit and also as a plasmonic spectroscopy or filter. We propose a binary plasmonic method to design the binary plasmonic structure (BPS), which is used to launch surface plasmon polaritons (SPPs) to a desired pattern. The BPS is composed of binary pixelated grooves. When a plane wave illuminates the BPS perpendicularly, the relative phases of the launched SPPs are determined by the positions of the grooves, which are designed by a simulated annealing algorithm. Here, we obtain single, three, and five SPP focal spots along the line parallel to the BPS, respectively, and three focal spots, which are located at the apexes of a triangle. The experiment agrees well with the numerical simulation. We propose a surface plasmon launching diffraction grating (SPLDG) to obtain multiple focal spots of SPs with nearly equal intensity. The SPLDG is composed of grooves that are located on concentric arcs, whose projections on the chord form a grating. When the incident plane wave illuminates the grating, SPs launched and diffracted into different directions will be approximately focused to multispots on a circle. Here, we obtain three and five focuses and the numerical simulation agrees well with the experiment. The Talbot effect of the surface plasmon polaritons (SPPs) using SPP launching gratings is studied experimentally. Talbot carpets are obtained and the Talbot distance is given when the paraxial approximation is not satisfied. Multi-layer and multi-level-phase launching gratings are designed to enhance the intensities of the amplitude-modulated revivals. Effective focusing of SPPs with multiple focal spots and a subwavelength full width at half maximum is obtained by using a three-layer four-level-phase launching grating. Although the leakage radiation (LR) image intensity is considered to be in proportion to the surface plasmon polariton (SPP) intensity at the metal–air interface, it has not been proven experimentally, to the best of our knowledge. Here we investigate the relationship between the measured LR intensity profile of SPP interference fringes, which are produced by two SPP launching gratings, and the simulated SPP intensity. The experimental modulation depths agree well with the simulation result of the in-plane electric field component of SPPs, which demonstrates that the image intensity in LR microscopy provides the intensity profile of the in-plane component. We propose a refractive index sensor based on the interference of two surface-plasmon waves on both surfaces of a gold film with a two-slit structure. The phase of the interference was solved, and the dispersion relation of the real part of Au dielectric function was considered. The sensor was performed with NaCl−H2O solutions of different concentrations and exhibited a linear response and a high sensitivity of 4547 nm/RIU (refractive index unit) to the refractive index change. Note: all of the PDF files linked in this page are copyrighted. They are provided for your convenience, while you can download them only if you are entitled to do so by the corresponding publishers.